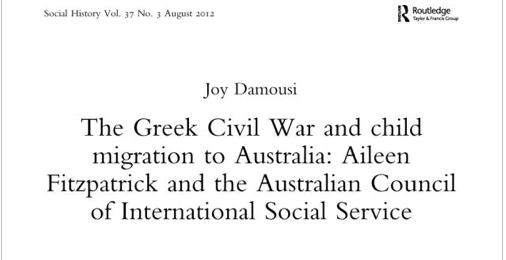 This is an interesting paper that describes the removal of Greek children during the Greek Civil War and the efforts of Australia and other countries to try and reunite families. . . . . I shall briefly outline the circumstances under which children were removed from their families, and Australia's role on the world stage with regard to child migration at this time. The Greek Civil War created conditions whereby children were removed from their homes out of war zones and into neighbouring eastern European countries. It was the first in which incipient Cold War rivalries caused a civil war. Following the Second World War, Greece was alone in its inability to find a peaceful solution to the post-war order. While the leaders of the Civil War were communist-inspired and had external links, it was a local struggle. After the Second World War, the population in Greece was deeply alienated from and frustrated by its political leadership. The KKE (Communist party) had led the resistance against Germany through the EAM (National Liberation Front) and its military section ELAS (National People's Liberation Army). Meanwhile, the liberation of Greece in October 1944 saw the establishment in Athens of a predominantly anti-communist government run by the British. The liberation period also saw the re-emergence of political groups who were openly hostile to the communists. This fragile coalition was short lived. In 1944 Prime Minister Papandreou ordered ELAS to disarm and disband. Fighting then broke out between anti-communists and British troops on the one side and ELAS on the other, with ELAS eventually forced into capitulation. The parliamentary elections of March 1946 were boycotted by the KKE, and it produced a majority for the conservative royalist Populist People's party. The KKE took the revolutionary path. In northern Greece, near and surrounding the town of Florina, the Greek Civil War was particularly brutal. In this section of Greece the ‘Macedonian Question’ was especially acute. It was in the northern part of Greece, where the fighting was most intense, that children were removed from their parents. Debate continues as to whether the communists forcibly removed their children or whether they were voluntarily given up. A term was used to describe this event – the paidomazoma – the removal of children. The result was that approximately 28,000 children crossed the borders into eastern European countries during the course of the Civil War. Children were moved to a number of countries, including Romania, Yugoslavia, Czechoslovakia, Poland and Hungary. Despite efforts made by the International Red Cross and the United Nations to retrieve them, only Yugoslavia co-operated, but the numbers of children returned was small. By 1952, Danforth estimates that fewer than 600 had been repatriated and all from Yugoslavia, despite 12,000 claims having been made by parents. Some of these children who were separated from their parents became the subject of the parents' search after they migrated to Australia. Children found their way to Germany, Canada (especially Toronto), the USA and France. A detailed study of how children were reunited with their parents in countries where this took place awaits further consideration. LINK TO FREE ONLINE COPY OF THIS PAPER - this link will lead you to the Google results for scholarly papers for this title - click on the title and you will be able to access the article for free.